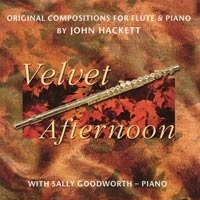 The first solo album by John Hackett with Sally Goodworth on piano. Velvet Afternoon is inspired by the music of Erik Satie and other influential classical composers and is richly melodic. The style is distinctly classical but the emphasis is on good tunes with a relaxing contemporary feel.